Telfer has elected to retire, per his official Twitter account. 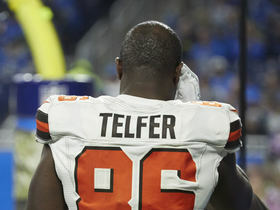 Analysis: Telfer (undisclosed), who spent each of his two seasons in the league with the Browns, was nearly traded to Kansas City in exchange for linebacker Dadi Nicolas earlier in the offseason. The trade was called off, and the Browns elected to instead waive Telfer. The 26-year-old then failed to pass a physical with the Colts before being let go. The 2016 sixth-rounder having logged five receptions for 40 yards over 30 games over his two NFL seasons. Telfer was waived by the Colts following a failed physical. Telfer was claimed off waivers Monday, Ian Rapoport of NFL.com reports. Analysis: After a trade between the Browns and Chiefs fell through last week, Telfer was waived by Cleveland, which allowed the Colts to pick up the 25-year-old tight end. He'll battle for a roster spot throughout the offseason program and into training camp, though even if he does make the team, Telfer likely will be used primarily as a blocker, and that severely limits any potential fantasy value. 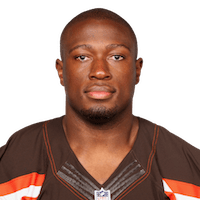 The trade that was supposed to send Telfer to Kansas City from Cleveland in exchange for linebacker Dadi Nicolas has been cancelled, and Telfer will be waived by the Browns, Field Yates of ESPN reports. Analysis: It's unclear what prevented this trade from happening, and Telfer could still be picked up by the Chiefs. The 2015 sixth-round pick is a solid run blocker, but he has just five receptions for 40 yards in 30 career games. Telfer is being traded from the Browns to the Chiefs in exchange for linebacker Dadi Nicolas, Field Yates of ESPN reports. Analysis: Telfer officially started 14 games for the Browns last season, but pulled in just three receptions for 36 yards while mainly being used as a run blocker. Despite the change in scenery, Telfer's role in the passing game figures to remain minimal with a Chiefs team that already has Travis Kelce and Demetrius Harris at tight end. The 2015 sixth-round pick lacks fantasy appeal, as his main focus will be opening room for Kareem Hunt. Telfer finished the 2017 season with three catches for 36 yards. Analysis: Though Telfer was listed as Cleveland's first-string tight end week in and week out, that was never really the case. Seth DeValve and David Njoku dominated the tight end snaps and were heavily involved in the offense, while Telfer was mainly used in run-blocking situations. The 25-year-old has just five receptions in his first two years in the NFL, and doesn't merit any fantasy consideration. Telfer (undisclosed) wasn't listed on the Browns' injury report Wednesday. Analysis: Telfer left Week 13 game against the Chargers with a suspected concussion, but head coach Hue Jackson later indicated the tight end was dealing with a separate injury. Whatever that injury was, it apparently wasn't significant, as Telfer's full practice puts him on track to play Sunday against the Packers. With just two receptions and no red-zone targets through 12 games this season, Telfer functions mostly as a blocker for the Browns. Telfer does not have a concussion but is dealing with another injury, and coach Hue Jackson said Monday that he thinks the tight end is going to be fine, Nate Ulrich of the Akron Beacon Journal reports. Analysis: There doesn't appear to be much concern surrounding Telfer's injury, but there is also no report in regards to exactly what it is he is dealing with. Expect another update to come once the Browns release their official injury report later this week. Telfer is questionable to return to Sunday's game against the Chargers as he is evaluated for a concussion, Nate Ulrich of the Akron Beacon Journal reports. Analysis: Telfer would need to clear the league-mandated concussion protocol if the concussion is confirmed. The Browns would operate the rest of Sunday's game without a No. 3 tight end should the 25-year-old be unable to return. Telfer (eye) returned to Sunday's game against the Lions, Scott Petrak of the Elyria Chronicle-Telegram reports. Analysis: Telfer will return to his role as a reserve tight end, and he shouldn't be expected to contribute much outside of run blocking and special teams. Telfer injured his eye Sunday against the Lions and is questionable to return, Nate Ulrich of the Akron Beacon Journal reports. Analysis: Telfer's main role is as a run blocker for the Browns, so he shouldn't be considered for fantasy lineups. However, that leaves just David Njoku and Seth DeValve to pick up the tight end duties until Telfer can return.